Repercussions » N. Carolina was forced to change its policy after too many endangered red wolves were killed. Utah wildlife managers and state attorneys insist Utah’s controversial coyote bounty program does not conflict with the Endangered Species Act. But at least one other state was forced to change its coyote-culling hunt after too many endangered wolves were killed. Potential crossover between Utah’s free-wheeling coyote hunt and the federal program for protecting animals threatened with extinction became clear last month after a hunter said he confused an endangered gray wolf for a coyote before he illegally shot and killed it. 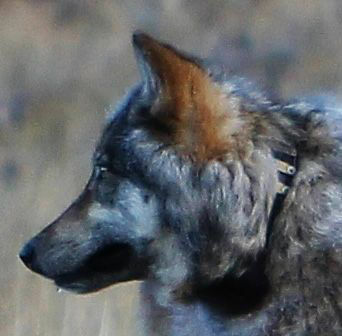 The U.S Fish and Wildlife Service and Utah Division of Wildlife Resources continue to investigate the circumstancesthat left a collared, 3-year-old female wolf dead outside Beaver on Dec. 28. Utah Assistant Attorney General Martin Bushman said the Endangered Species Act does “provide for instances where the [killing] of animals that look like other species” can happen. But that hasn’t happened in the case of gray wolves. “Coyotes are not listed as threatened or endangered and the state maintains the authority to regulate the take however it wants to go about it,” Bushman said. But there is a precedent for groups challenging the open hunting of coyotes in areas where wolves are protected. Three conservation groups settled a lawsuit last fall after accusing the North Carolina Wildlife Resources Commission with violating endangered species protections by proposing nighttime hunting with lights and an unlimited take for coyotes. Just 100 red wolves, a cousin of the gray wolf, live in North Carolina. Smaller than the gray wolf, the red wolf is closer to the size of coyotes. According to the Animal Welfare Institute, one of the plaintiffs in the suit, 20 red wolves have died from gunshots and hunting is suspected in 18 other wolf deaths since 2008. Since 2012, the institute reports, five people have admitted they shot wolves thinking the canines were coyotes. According to the News and Observer in Raleigh, North Carolina, the lawsuit was settled when the wildlife commission agreed to keep coyote hunting illegal at night in five counties. Daytime hunting of coyotes would require a special permit. Furthermore, coyote hunting in the five counties will be suspended if two or more red wolves are shot in the same year on state game lands by people hunting coyotes. The red wolf population is obviously more threatened by extinction than the gray wolf. U.S. Fish and Wildlife estimated 1,674 gray wolves were living in Idaho, Montana, Oregon, Washington and Wyoming at the end of 2012. Mike Jimenez, Fish and Wildlife’s northern Rocky Mountain wolf recovery coordinator, said gray wolves showing up near Beaver or on the North Rim of the Grand Canyon is a sign that the effort to restore their population in the West is working. The name of the man who shot the wolf has not been released and it is not clear if the hunter was participating in Utah’s $50 coyote bounty program. Utah lawmakers created the bounty as part of the Mule Deer Preservation Act in 2012. Hunters who want to collect a bounty must register and follow procedures to collect their money, but there is no license required to shoot coyotes in Utah, where they are an unprotected species. More than 14,000 coyotes were turned in for the bounty in the first two years of the program. Nothing in Utah’s online bounty registration process helps hunters tell the difference between a coyote and a wolf. Nor is there information alerting hunters that they need to be aware of the possibility of seeing the endangered species in Utah. 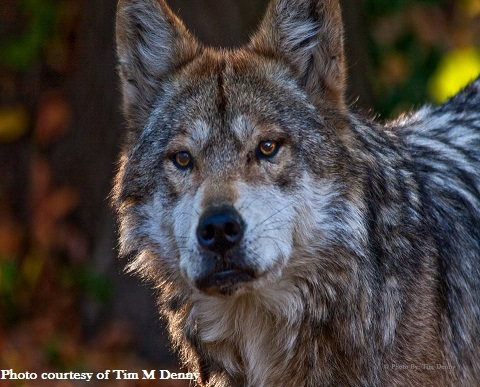 Wildlife managers acknowledge that might change as the number of wolves visiting Utah grows. She must be lonely, spending Thanksgiving weekend wandering the Grand Canyon’s North Rim all on her own. She’s a fertile, female wolf, and finding a mate is likely the force that drove her southward from her home in the northern Rocky Mountains. Of course, there are 83 of them — about 200 miles southeast in the White Mountains and adjacent areas of eastern Arizona and western New Mexico. All that stands between her and them is the Grand Canyon and our wildlife bureaucracy. This week, the U.S. Fish and Wildlife Service released documents that spell out some of the details of how they propose to manage the reintroduced Mexican gray wolves of the Blue Range Wolf Recovery Area. That’s where efforts to reintroduce endangered Mexican gray wolves began in 1998 and foundered for more than a decade before the population began to grow again over the last few years. The documents show that the service plans to expand the areas in which the wolves are allowed to wander — a welcome change from the strict boundaries and behavioral rules that Arizona Game and Fish enforced during the first decade-plus of the effort. The newly opened areas would include about half of Arizona, including all of the southeastern quadrant, as well as about a third of New Mexico, mostly in the southwestern part of that state. But the service sets a strict northern boundary for the Mexican gray wolves at Interstate 40. So even if the expanded range were already in effect now, wildlife managers would still prevent wolves from roaming northwest toward the Grand Canyon, cutting the distance between them and this potential new pack member and mate. Wolves north of that line could be picked up and returned or even killed if necessary. That’s a shame, because this female wolf is from a different subspecies of gray wolves. Her genes, introduced to the semi-inbred population in the Blue Range, would increase their genetic diversity and vitality considerably. It’s also a shame because it puts our abstract rules and boundaries on what could be a natural flow. 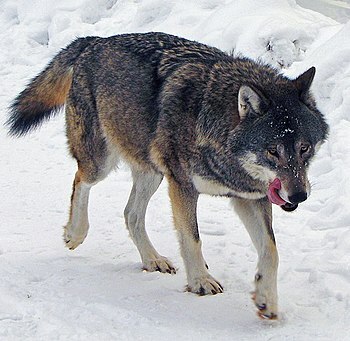 “Wolf geneticists over the last decade have been documenting that there was genetically a gradient from the Mexican gray wolf to the northern Rockies wolves,” conservation biologistCarlos Carroll told me. In other words, there wasn’t a clear genetic distinction between Mexican gray wolves in the south and northern gray wolves, but rather a transition zone between, say, Arizona and Wyoming, where the wolves were less and less Mexican the farther north they were found. “That old paradigm of drawing hard lines on a map to divide subspecies — that was typical of naturalists 100 years ago,” said Carroll, of the Klamath Center for Conservation Research. The paper also points to the Grand Canyon area, all of which is north of Interstate 40, as one of the most suitable areas for additional Mexican gray wolf populations. Arizona Game and Fish, which helped mold this latest Fish and Wildlife Service proposal, argues there is reason to have a northern boundary. In short, the idea is that “we want Mexican wolves where Mexican wolves were,” explained Jim DeVos, the assistant director of Arizona Game and Fish overseeing wildlife. The scientific research describes the wolves as largely having been a creature of Southeastern Arizona, as well as adjacent New Mexico and Mexico, he said. But it would be difficult to draw a line at, say, Mount Ord in the White Mountains and say no wolves should go north of there. My question is: Why demarcate the territory at all? Having reintroduced these animals, why not let them do what they obviously do naturally — roam, run into each other, mate and create their own packs and populations?